I was lucky enough to get an early copy of the newest version of Blood Bowl from GW and I eagerly cracked it open. In today's review I go over the actual contents of the box including the pitch, the minis, and the rulebook. I know it may seem silly to review the packaging, but for a game like Blood Bowl I think it's worthwhile. Since you will most likely be storing your pitch, cards, and tokens at the very least in this box and toting it around with you, it's important that it's of good quality, and always a plus if it looks nice too. Luckily the box on this is definitely sturdy enough to survive frequent use and the artwork on it is pretty awesome looking. While the cover image looks very similar to previous pieces of artwork for the video game, it utilizes the new gear and uniforms for the teams. I'm pretty sure this is by Karl Kopinski as well, who is an amazing artists and I don't think I have seen him do a single bad piece of artwork. Once you crack open the box you are greeted with all of the different plastic sprues. You get one unique sprue for each team twice for a total of 4 sprues, plus another one for the scatter markers and pass ruler. In this set you of course get the Human and Orc team. Each team consists of 12 models, 2 loose footballs, 4 footballs that fit into the base, 2 coins, and 2 trophy/marker things. I'll go into more detail on these in a moment. The sprue for the gaming accessories is really quite nice. They are all Blood Bowl themed with football and helmets. From what I was told by my friend, they are a huge improvement off of the old ones, especially the pass ruler. What I really like about that one in particular is that it comes in two pieces. While you can glue it if you want, the two halves stay locked together without glue and come apart easily enough, making it easy to store away. I probably won't end up gluing mine together. You can leave these unpainted if you want, or paint them up as elaborately as you want. I will most likely just spray mine gold, give them a quick shade, and finish off with a drybrush. Underneath these is a card stock divider which protects all of the card and paper elements of the game from the pokey plastic. It also has some info on upcoming releases on the flip side of it, such as a Blood Bowl App, the Skaven team (which we've already seen) and the first supplement for it, Death Zone Season One. I'm excited to see what this includes. From what I've gathered from the main rule book, this is probably where we will first see League rules, and I'm suspecting the rules for the Skaven and Dwarf teams. Now we're onto the pitch, rulebook, cards, and dice. I'm sure everyone has seen the pitch/game board at this point, but it really is nice. The image printed on it is super high quality and it's double sided. On one side you have the nice "clean" Human pitch, and on the other side is the Orc one. While the Human's side is lush with green grass, the Orc side is pretty much just a mud pit which is perfect for their aesthetic. I'm really happy that they did this since it was an easy thing to include, but enhances the game a lot. Even with just one game board you don't have to play every game on the same field, you can flip it between games for some variety. I wouldn't be too surprised if we see other variants of this released in the future, like a Skaven and Dwarf game board for the two upcoming teams. It also folds down to 1/6th of its size to pack away nice and easy. You also get the dugouts for each team. Just like with the pitch, this is double sided. One side has the nice clean Human dugout. While the other has the suitably messy Orc dugout. Both have spots for your injured and dead players, as well as players in reserve. This is also where you keep track of your score, turn, and how many re-rolls you have. Remember to move your turn marker each turn before you activate any players. If you don't and your opponent catches it before you do then you either lose a re-roll or have to end your turn immediately. With the cards you get a bunch of Special Play cards of two different varieties, Miscellaneous Mayhem and Random Event, the player cards for each team, and four different Star Players. Each team gets four player cards, one for each type of player, which I'll go over in a bit. The Star Players you get are Griff Oberwald, Mighty Zug, Morg N' Thorg, and Varag Ghoul-Chewer. All of these are returning players from previous versions of the game. Though we get the rules for them here, there are no new models as of yet, but I'm sure these will be the first Star Players to get models soon. The dice are blue for the Humans and green for the Orcs. Each team gets two D6, a D8 (for scattering), a D16 (for randomizing players), and three special block dice. Most importantly of all, on the D6 the icon is on the 6! From what my friend told me, the rules are pretty much exactly the same as previous editions, with just minor tweaks here and there. I'm sure this is very welcome to existing players who already loved the game. I have never played Blood Bowl before though, so how is it for a newbie like myself? All of the rules are fairly easy to grasp, even with just reading them. Of course, they really sink in once you play a game or two, but it's nice to have a good understanding of what you're getting into. They break it up into basic rules and extra rules. The basic rules cover things like moving, blocking, passing, catching, etc. Everything you need to play through a game of Blood Bowl basically. Once you have read all of the basic rules you can play a game, but I recommend powering through the extra rules as well. It's not that much more to remember, and it adds a lot to the game. The extra rules bring in stuff like the Kick Off table, where you roll after each Kick Off to see what zany things may happen before the drive even starts; weather, which can affect the game; using the Special Play cards; all of the various skills your player may have like Sure Hands or Block; Going For It! ; handing off the ball; and of course, kicking a player while they're down amongst other things. This is where a lot of the zaniness of Blood Bowl is brought in, so like I said, I recommend learning it for your games. There are also a couple of "Drills" before the rules even start to help run you through basic concepts like moving, passing, and blocking. The rulebook itself is not very thick and is a saddle staple soft cover. The rules take up about half of it, with the other half being dedicated to the backstory and some hobby bits. After the rules section you get the lore. I found this really amusing. So it's true, Blood Bowl is still set firmly in the Old World pre-End Times, but with a twist. Instead of fighting all of the time, most of the races just play Blood Bowl to settle their disputes. There's a funny bit in there about how during a pause in a battle one day an Orc stumbled upon a strange "temple." Once inside they found a massive book, which they brought in a Dwarf Loremaster to read and decipher. It turns out the temple was from a lost land called Amorica and was dedicated to a religion called Nuffle. I love all of the nods they throw in to American Football. The first commissioner of Blood Bowl even takes the name of Roze-El to honor a name they found in the book. It's all extremely tongue in cheek, just as it should be. It then takes you through the rest of the history of Blood Bowl up to the modern day, which is in the 2490's. They also include stuff like past game coverage, rankings, and little tidbits added in from the announcing duo of Jim and Bob, the unofficial mascots of Blood Bowl. There's not a ton of artwork, but what's in there is pretty cool looking. I think most of it was from the two video games they made. At the end of the book we get instructions on how to assemble all of the models, and most importantly, paint guides for them! For the humans it shows you how to paint them as the Reikland Raiders and for the Orcs it shows you the colors of the Gouged Eye. These are the colors the studio has painted their teams in, and also the teams in all of the artwork. These painting guides are done in the style of the Paint Splatters from the Weekly White Dwarfs, showing you step by step how to do each color. It really is great for anyone wanting to paint them in these colors, and is even helpful if you plan on doing other teams, as long as you're utilizing any of the colors from these guides. The only thing I wish they had included would have been a gallery of other teams' colors. They have released four examples of other Orc and Human teams on the Blood Bowl Facebook page so far, but it would have been nice to have it all printed here as well. The player cards are really simple, with only four stats listed on them as well as any special abilities. You have your movement value (MA), or how many squares you can move; your Strength (ST) which come into play when blocking; your Agility (AG) which is used for dodging, catching, and throwing; and finally your Armor Value (AV) which is for when you get knocked down. The special abilities are all listed in the rule book, with the basic ones being Dodge, Block, Sure Hands, Pass, and Catch. These all do various things from granting you re-rolls on certain rolls during the game, such as dodging, or giving you an upper hand in blocking. Now onto the minis themselves. They are definitely AoS scale, with even the humans comfortably filling up their 32mm bases. This probably means they will look big compared to older Blood Bowl models, but it does allow the sculptors to get even more detail in. They're all fairly dynamic with really cool uniforms. The Humans get six Lineman, two Throwers, two Catchers, and two Blitzers while the Orcs get six Lineman, two Throwers, two Black Orc Blockers, and two Blitzers. The Orc Blitzers are probably my favorite model from the set. He's just so dynamic with how they have him posed running and his helmet is pretty sweet. The Human Catcher is really nice too. In fact, they are all really, really nice quality models. The Humans are cast in a blue plastic, with the Orcs cast in a green plastic. This way you can start using them straight out of the box without having to paint them if you don't want to. They're all push fit as well and only three pieces each, so you don't even have to glue them if you don't want to. I glued mine of course. The mold lines on them are almost non-existent, which makes it that much easier to assemble them. I scraped off the few mold lines there were, but you could probably get away with leaving them alone if you wanted. The bases are super unique too. They're 32mm bases with a slot for the model, like the slotta bases of old. They also have a hole in the front of them where you can attach one of the four footballs that each team comes with. This makes it very easy, and nice looking when you need to designate who has the ball. The plastic seems like it may be a tiny bit softer then the standard stuff used by GW, but not by a bunch. Just be careful when trimming them off the sprue to avoid accidentally smushing any errant spikes. This is a definite win for Games Workshop and is sure to please new fans and veterans alike. The quality of everything is outstanding, especially the miniatures, which just have so much movement in them. All of the accessories and the game board itself are super nice as well and definitely worth the price. 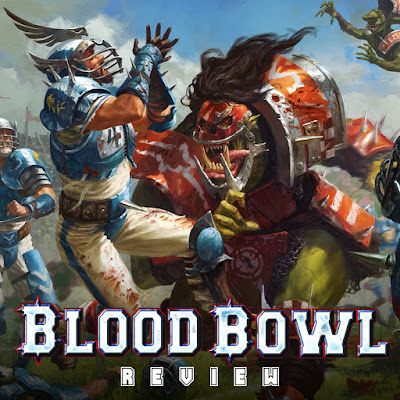 If you are on the fence about whether or not you want to pick up Blood Bowl I would say you should give it a go. At the very least split the box with a friend. Of course the best resource for everything Blood Bowl is the official Blood Bowl website put together by Games Workshop. Here you can find a bunch of pictures and videos, including a video overview of how the game is played. It's super slick and modern looking and I expect it will be updated regularly as stuff comes out. As soon as I got my copy of the game I put everything together so I could get a game in with my friend and test it out. I will have my overview of my first game from the perspective of a newbie to all of this on Monday, so keep a look out for that! I was going to include it in this review originally, but it all ended up just being way too long.